Removals Team is a West London based and operating company with years of experience in providing comprehensive, cost-efficient moving solutions for domestic and commercial clients alike. We are dedicated professionals with years of experience in the field of removal services in West London. One thing is certain when you have us by your side throughout the duration of your moving day – there will be no hassle or stress involved in the overall experience at all. West London home relocations are just as complex and stressful as anywhere else, which is why it is of crucial importance to have reliable and responsible movers by your side on every step. This is the place where we step in and take charge. We offer you a West London covering removal service that is cheap, reliable, child-friendly and environmentally responsible. Furthermore you can count on us to complete your office relocation in W and NW with precision and care for the detail. Our commercial movers are licensed, insured and very experienced. They are careful on every step of the jobs they have been hired to do, and never fail to accomplish optimal results with minimal hassle and stress. You will be doing your company a lot of good if you chose us to be the people relocating its headquarters. Small apartments or spacious houses – we will quickly help you move home regardless of the size of your property. We, from Removals Team, are well known for providing some of the most time-efficient removals in West London. Hire us and we will fit into your planned schedule and time frames without any problem. There will be no delays because we are much organised and our up-to-date and fuel-efficient moving vehicles are equipped with advanced GPS tracking systems. No matter whether you choose to hire just one of our well-versed movers or a whole team of moving specialists, you are guaranteed to receive assistance from properly trained, fully certified and highly qualified pros. With our comprehensive moving services in West London, you will not even break a sweat since we will take care of even the smallest details related to your property relocation. Do not hesitate to call us for a reliable packing service in West London as well. Just like you can imagine, packing is the most important part of every relocation, which is why it should be handled with care and respect. This is the place where we will make sure all your needs are covered. From the tested methods to the high-end packing supplies – labels, wrapping, durable double-walled removal boxes – we have it all, and it will be delivered to you on a very attractive price. Did you know that we, from Removals Team, are fully-insured? Book us and you will enjoy an inexpensive and secure house removal in West London. We will use professional moving equipment like straps, van ramps and belts when we lift, load and unload your items so that everything you own remains in a perfect condition. The other great news is that we have an incredibly transparent pricing and zero surcharges. Check out our custom removal quote calculator and the great mid-week discounts that we can offer to you. Our friendly staff of customer support experts is available around the clock over the phone and via email for inquiries about our prices, schedule and services. They will gladly help you with anything that you need. Logically enough, the designation West London refers to these areas of the capital that lie to the West of the City of London. More precisely, it occupies the following London Boroughs – Brent, Ealing, Hammersmith and Fulham, Harrow, Hillingdon, Hounslow and Richmond upon Thames. Everyone who knows something about the capital knows that those are some of the finest residential districts in London as of today. The Richmond Riverside is reputed as being one of the most beautiful parts of the River Thames today. The London Heathrow International Airport is also located in West London. The airport is the main passenger and commercial transport hub in Britain, with a great importance for the economy of the area. West London is inhabited by nearly 1.5 million people. Even though the capital of the United Kingdom is known for its great ethnic diversity, its western part is slightly more multicultural than the other London sub-regions. It is estimated that every fifth person living in West London was not born in the country. This sub-region of the English capital also features some of the poorest and some of the wealthiest districts in the city. 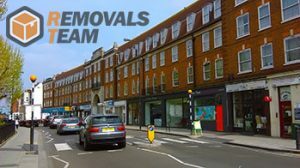 When planning a residential property removal in West London you can turn to us at Removals Team for a bespoke, value for money moving solution which meets you needs and budget requirements in full. We aim to provide affordable and convenient assistance through specially organised removals. With us, people are guaranteed to receive an excellent removal solution at a very good price. There is no room for errors in our professional home moving services. This is why we work with dedicated staff who are experienced in all aspects of house relocation. All necessary measures are taken to prevent damage, loss of items or costly delays in delivery of goods from A to B. Customers have the option to modify their removal according to individual needs and wants, as well as to request additional options like packing, storage, cleaning (tenancy, move in, move out), junk disposal / full property clearances. Adding extra services to the removal is a proven way to get more value for money and save yourself time and hassles. Cost is always a factor, no matter what the removal project. We know this and aim to provide customers with a truly cost effective solution which gives them best value for money given the circumstances. Our service pricing is fair and competitive, free of any hidden fees. All quoted prices are based on accurate job estimates which reflect the true scale of the removal. Free viewings and onsite quotes available to all customers by request. South London, is that half of the British capital which stretches south of the River Thames. In modern times, South London comprises of 12 boroughs (some with Royal status), home to just under three million people. The area taken by the boroughs of South London is about 250 sq. miles or 635 sq. km.